2010 model Polo 6 on 107 000 km. Extras include: 17" mags on low profile tyres; lowered suspension; original VW mud flaps; original VW smash & grab tint; HiD xenon headlights with matching park, number plate and interior lights; and an anti hi-jack system. Service history also available. 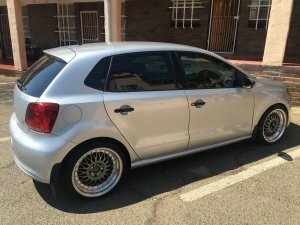 2010 Volkswagen polo vivo, accident free, very clean and excellent condition.